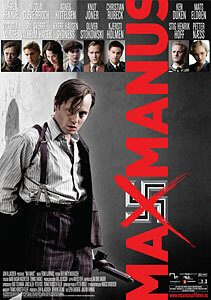 Max Manus (Directors: Joachim Rønning and Espen Sandberg): Here is a Norwegian film about a hero of that country’s World War 2 resistance movement that is as slick and polished as any Hollywood blockbuster. Unfortunately, it also has all the brains of a typical Hollywood blockbuster. Not surprisingly, this film has broken box office records in Norway, becoming the highest-grossing domestic film there since 1975. I think the real Max Manus deserved better. As the film begins, Max Manus (Aksel Hennie) is an uneducated but patriotic young man who volunteers to help the Finns repel an invasion from Stalin’s Russia in 1940. After being wounded in that conflict, he returns home to find Norway occupied by the Nazis, and the King and his government in exile in Britain. Gathering a group of young men around him determined to resist the occupation, they begin publishing leaflets denouncing the Germans and their collaborators. After being ambushed in his second-storey apartment by the authorities, he jumps out the window and falls to the street injured. While in hospital being treated for his injuries, he is able to get messages out to his friends, and soon escapes in spectacular fashion. After this, he is hustled out of the country eventually making his way to Scotland, where he joins the Norwegian Independent Company. Further training in sabotage techniques follow, and in 1943 he parachutes back into Norway with a small team of saboteurs. From then on, he determines to do as much damage to the occupying forces as possible, and he succeeds in destroying numerous German boats and ships in Oslo harbour, including a huge transport ship called the Donau in 1945.
feel so artificial? Succumbing to the usual pitfalls of the biopic, the film hurries through all the major events in his wartime career, a period of five years. In that time, Max fought both the Russians and the Germans, formed a strong bond with his group, especially his best friend Gregers Gram, and fell in love with Tikken Lindebrække, who would later become his wife. The script sketches all of these things in, but fails to colour them in with details which would add emotional and historical depth. The film seems primarily concerned with showing the spectacle of Manus’ acts of sabotage, and here it mostly succeeds. Two set pieces involving the mining of ships in the harbour are well-directed, although it’s telling that there is a curious lack of preparation shown in the film. Despite that, the characters are all badly underwritten, even Max who, despite a good performance from Aksel Hennie, still seems too artificially heroic and one-dimensional to be a real person. His reckless machismo as his friends are captured and killed seems false, and his romance with Tikken is hardly written at all. It’s hard to say who the filmmakers are trying to reach with this film. Norwegians would likely know some of the outlines of Max Manus’ life, so a more focussed film which zeroed in on, for instance, the destruction of the Donau would have been far more interesting. But I suspect the filmmakers were trying to reach an international audience and so felt they needed to cover a lot more ground. Unfortunately, they’ve created nothing more than a shallow, melodramatic and rather conventional war movie that borders on hagiography. I think that’s the worst kind of self-sabotage, and something a truly interesting character like Max Manus doesn’t deserve. We’re notified in an end title that after the war, Max Manus established a successful office supply company, and the bathos of that detail alone punctures much of the mythmaking of the previous two hours. Max Manus opens in Toronto, Vancouver and Halifax on April 2nd. This entry was posted in Theatrical Release and tagged nazis, norway, worldwar2, ww2. Bookmark the permalink.